Both men and women's team struggling to qualify for medal race. 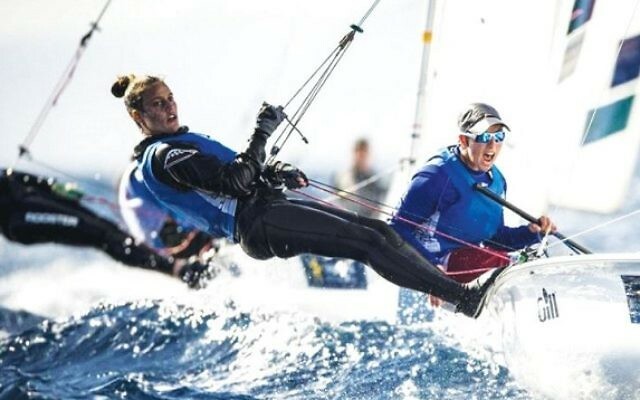 Israel’s two 470 sailing sides endured another disappointing day at the Marina Da Gloria, before poor weather conditions put an early end to the day’s action. Eyal Levin and Dan Froyliche have slipped a further place down in the Men’s race to 18th, following their 21st place finish in the fifth race. The scheduled sixth race was postponed to the weather, though the pair now have it all to do in the remaining five races if they’re to finish in the top ten and qualify for the medal race. It was a similar story for Israel’s women duo of Gil Cohen and Nina Amir, who also slipped one position down the table into 18th place, following their 17th place finish in their fifth race, before the weather intervened.